What began simply as a song and book about our "connectedness" in the world has grown into a popular bully prevention program available to elementary schools. Picture a beaded necklace, where every bead is a different size, shape and color, but all held together by one string. This is the concept Dennis Warner used to create an amazing book now being utilized throughout the USA and other countries, showing kids and adults that we are all connected. 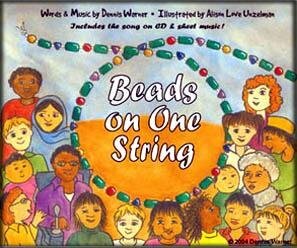 The Beads on One String Project focuses on the importance of positive behavior and interaction. Heights Elementary was happy to have Mr. Dennis Warner come and visit and share this message with our students and staff. Ask your student to share the song with you at home and disucss bullying and diversity as a family. For more information or to order Mr. Warner's book or cd's click HERE.